Living in Vancouver makes it a bit tricky for the “off” season. For the most part, our weather is temperate to ride all year long. This makes it hard to make excuses as to why you’re not getting out on your bike but, as I’ve discovered, riding shouldn’t be a chore or a box you should feel like you need to check. It should bring joy! I’ve definitely had days where I felt less than enthusiastic about the ride I’m on but I never want to get to the point where I feel miserable getting out on my bike. To that end, I’ve (mostly) avoided riding when there’s a lot of snow on the mountains or if I really, truly feel like it’s just too much. Unfortunately for you, dear readers, that means my updates have been VERY sparse. We did get out on a lovely ride on New Year’s Day which, luckily, refuted something I was very afraid of happening. I haven’t lost all of the progress I made last year! Sure, I may have gained the weight back (sigh) but the skills are still kicking around in muscle memory. While I wasn’t out on my bike a lot I did find ways to stay active this winter. For Ryan’s birthday, he wanted to go snowshoeing with a group of friends which we did. I went for some runs, some rides, and some hikes. For the most part, I worked a billion hours a week and went to my mom’s house for the holidays where I ate a massive amount of food and indulged in a bit too much wine. Obviously, the training needs to start again…. as soon as this pesky snow melts! As far as indoor training goes, I was lucky enough to borrow a bike trainer for a friend of mine (as seen in the Port Moody excursion) to keep moving while the weather is bad. I’ve also enjoyed some much needed yoga. The other big event was my bike maintenance course. I did write about it at the time, but it has come in handy SO much in terms of feeling comfortable with taking care of my bike (and the bikes of my friends) and saving some money on mechanic fees. I highly recommend taking one if you have the chance. Getting to know your bike feels so freeing. NOW, what’s on the horizon? After the 45 day challenge last year, what could be coming this summer? That, for now, will remain a surprise. Stay tuned for updates on this year’s exciting challenge! This was definitely a foundations course covering a range of topics including: basic bike parts, body positioning, cornering, how to chose lines, climbing techniques, and more. It is very safe to say that I went from barely being able to ride in a straight line to starting to be comfortable with cornering (which terrified me previously). The climbing tips that were taught to us also have helped me immensely in my ability to drag myself up the mountain. The course started in the safety of a flat lot where we learned a bit of the basics of body positioning and form as well as some tips for cornering. We practiced getting on and off our bikes safely and quickly (a huge improvement on my previous technique of stop, fall over, and hope to land on my foot), played some games to help master cornering, starting and stopping, and even got to ride some skinnies in the parking lot. After that, we moved to real trails on the North Shore. I am absolutely not good at climbing. My endurance is garbage. I felt a little bit intimidated when everyone else seemed to be able to zip ahead and, magically, weren’t red as a tomato, completely drenched in sweat, and panting like their lives depended on it. I was nervous about being so far behind but Tammy always made sure to loop back to check on me and make sure I wasn’t killing myself. She even rode along with me for a while. When all else failed, I got off and walked. Learning the trails was extremely fun. 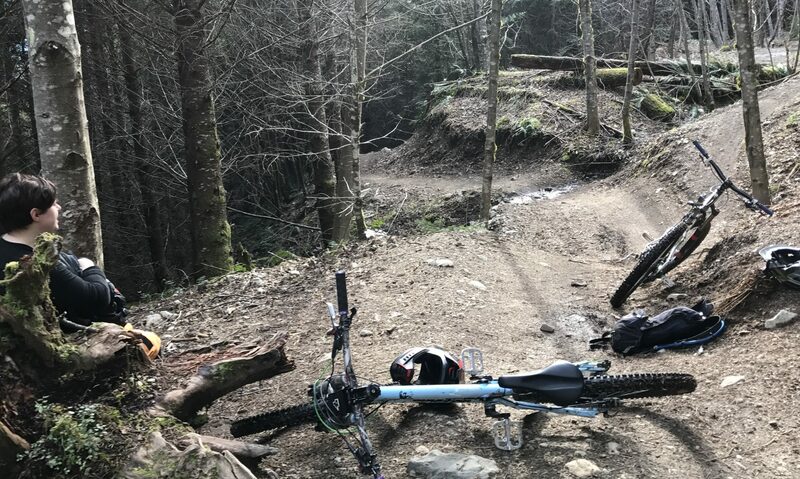 We were on beginner trails like Roadside Attraction on Fromme (where I developed an arch nemesis that I will talk about later) and practiced looking ahead, picking our lines, and keeping good form just like in the parking lot. Everyone was super supportive and it was a ton of fun. While I was still struggling with some things when the course was over, I definitely had the foundation skills that I could keep building on. I am proud to say I can now climb up more than I could before using the skills I was taught, and I’m not terrified of cornering! I know this isn’t how everybody learns and some people would rather just go out on their own and figure stuff out, but I would highly recommend courses like this for developing the foundation skills that are so important. We all know how hard it is to break a bad habit so even better if you start practicing good habits early on. It really felt more like a group ride than formal classroom instruction; we all supported each other and made sure no one was left behind–not even me. If you prefer to learn on your own but still want some support there are some really great options. Ryan Leech has some free and some paid skill development courses. If you’re looking for free, there’s a great YouTube channel called Skills with Phil. Both of these guys are great teachers and you can learn a lot from them. However you choose to learn is great as long as it works for you and you’re having fun on your bike because that’s the most important thing. So how about you guys? How did you learn?